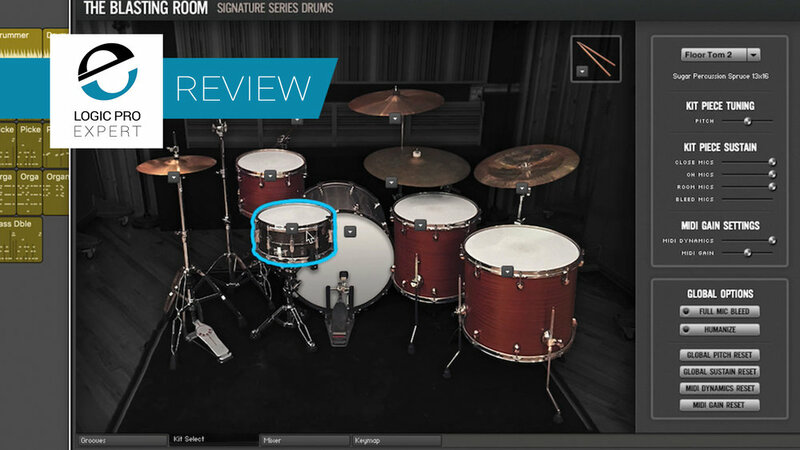 Eli Krantzberg reviews the Blasting Room Signature Series Drums, a premium drum sample library for Kontakt that was produced, engineered and mixed by Jason Livermore and Bill Stevenson at the Blasting Room in Fort Collins, Colorado. Room Sound is a relatively young company, but with a great track record straight out of the gate. Their first offering was the Kurt Ballou Signature series drum instrument. They have now followed up with the Blasting Room Signature Series Drums ($89.00), put together by Jason Livermore and Bill Stevenson. The drum samples are hosted by Kontakt or Kontakt Player and have a very nice intuitive interface. The four tabs at the bottom are used to switch between the grooves, kit piece select, mixer, and mapping pages. The plug-in includes a host of fantastic sounding built-in effects, designed for optimal sound with drums. The effects include not only EQ and compressors but transient shaping, distortion, and saturation effects as well. The internal grooves sound great. However, this plug-in works well in conjunction with Logic Pro’s Drummer as well. In the following video, I took Kyle’s basic SoCal groove, converted it to MIDI and played it back with the Blasting Room Drums. The only tweak required was re-mapping the hi-hat notes which took just a few seconds.